actually my first ukulele – this is how it all started. 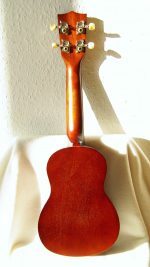 came with some black strings (possibly ghs), was soon restringed with aquila nylgut which improved the sound significantly. in the meantime i swapped the aquilas for aurora multicolor strings – made in usa, but generally speaking just dyed aquilas. yet slightly mellower in sound. right now i have some clear ukumele fluorocarbon strings on it; after a few days this seems to be the right decision. 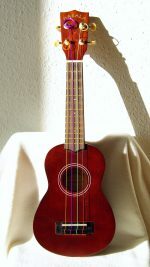 nothing spectacular, simply a laminate beginner’s uke; makala is the “budget” brand of the well-known kala ukulele company. action was a bit high and needed correction to improve intonation. weighs 370g.